Let The Wild Rumpus Never End! My sister suggested I blog about it, because she knows I love Maurice Sendak. I’m trying. The truest post, if I could swing it, would be a big blank page, room-size, with those three words in the middle and that’s it: Maurice Sendak died. I would sit in front of that big, blank page and cry, and then I would really, really want some crayons. I would color all around those words in blue scribbles and I wouldn’t even try to make them look like Wild Things. Then I would invite some neighbor kids in to color with me. That would be a little creepy– that crying lady with the blue crayons wants us to color with her—but the kids would respond just right. I would tell those kids to draw whatever they want—what they’re scared of, what comforts them, what they ate for breakfast. I would ask them to draw something from their favorite story, and I hope one of those kids would draw a Wild Thing. We would fill up that giant page until it became a forest, and maybe an ocean would tumble by with a private boat for Meg… to remember Maurice Sendak. I clearly remember reading Where the Wild Things Are when I was little. I remember being shocked at Max—he chased his dog with a fork!—and then feeling sorry for him, sitting up in his room without any supper. I remember the scratchy lines of the illustrations and the soft, greyish colors and knowing just how that room felt. It felt like winter, when dark comes early and you can’t play outside so you make up inside stuff, and that’s how you get into trouble. Yes, my childhood self empathized with Max, yes you have been very bad, and now you’re mad at everyone and sad at yourself because you know you shouldn’t have chased the dog. You’ve had a tantrum, and you’re tired from crying, and you still want to be angry but you want your mom more. Max was my people. Even more clearly, I remember reading Where the Wild Things Are to my son. Like every kid who’s ever been introduced to that book, Mo loved it, and we read it until he knew it by heart. I can still hear him reciting it in his biggest little voice, with the consonants mixed up. If you have ever heard a two-year-old yell, “LET THE WILD RUMPUS START!” then you probably share my soft spot for Maurice Sendak. What a genius Sendak was, to create a book with such lasting appeal that my children love it as much as I do. What it must have felt like for him to know that for almost 50 years, parents and children snuggled together and imagined themselves in the world he created. Nothing I could write would do him justice: his humor, the simple elegance of his words, his perspective on humanity, his respect for the intelligence of children. His stories remind us that dealing with reality requires a certain deftness of imagination that children possess naturally and adults must cultivate. 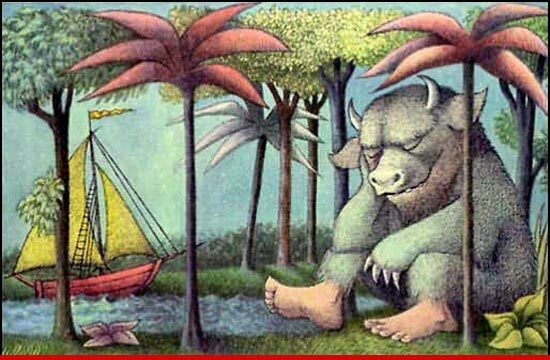 While I’ve only mentioned Where the Wild Things Are, Sendak’s legacy is extensive. You probably remember Little Bear, and Chicken Soup with Rice…so many. The year my son was born, he released We Are All in the Dumps with Jack and Guy, a sad and stirring picture book that reminds us that much of reality doesn’t make sense, but that doesn’t make it any less real. 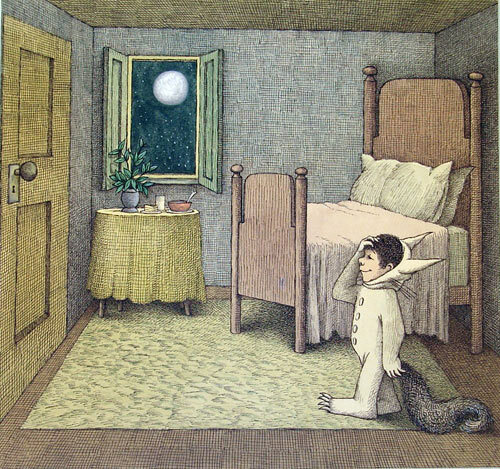 So good-bye, Maurice Sendak. Readers the world over are roaring terrible roars and gnashing terrible teeth for you. I hope that your dinner is waiting for you on the other side, and it is still hot. This entry was posted in Commentary and tagged childhood memories, childrens books, Maurice Sendak, parenting, Where the Wild Things Are by midlifemeg. Bookmark the permalink.